The Essential Seasonings For Every Kitchen!! This Foodie Essential Seasonings Gift Set includes the products that Your Culinary Wingman just can't live without! It's perfect for the person who want to explore new flavors in the kitchen, up their culinary game, or is just starting out in their own kitchen. It comes packaged in an attractive gift box and includes our two most versatile and best selling Spice Blends, two of our popular & easy-to-use Veggie Roasters and our favorite Dryglaze. Balsamic and Onion Veggie Roaster A blend of onions, balsamic, garlic, brown sugar, sea salt and spices that is delicious on brussel sprouts, potatoes or any root vegetable. Gluten Free. Parmesan Mediterranean Veggie Roaster A blend of Parmesan cheese, lemon peel, onion, garlic and spices that tastes great on hard-shell squash, potatoes, or any root vegetable. Gluten Free. Contains Dairy. Athenian Herb Dryglaze Honey granules melt with thyme and sundried tomato to brighten chicken and fish. Gluten Free. Your Culinary Wingman Urban Accents always has your back in the kitchen. Our focus is on quality, natural, small batch blended and creative flavors that we love to serve to our own friends and family. Find easy-to-use directions and suggestions on each label or package. Add some spice to your life! 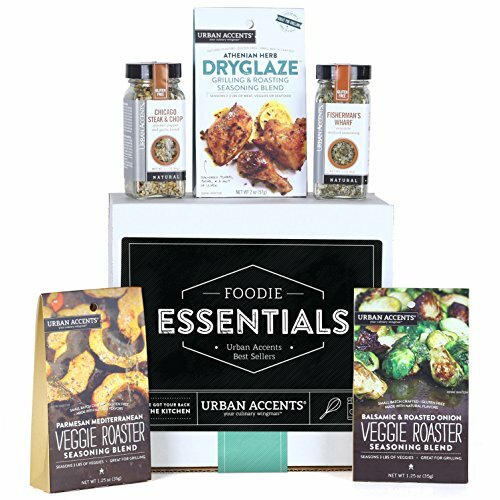 Whether it's to wish someone congratulations or a happy birthday, or a summer holiday, or time to amp up your own cooking game; it's the perfect time to buy Urban Accents' Foodie Essentials gift set. THE FOODIE'S ESSENTIALS: This ready-to-give Gourmet Spice Gift Set includes the spices and seasonings you just can't live without in the kitchen. Makes a great hostess gift! SPICE IT UP: Your grill spices set includes our two most versatile and best selling grilling spice blends: Chicago Steak & Chop and Fisherman's Wharf. AMP UP YOUR VEGGIES: You'll also get two of our favorite veggie roasters: Balsamic and Onion Veggie Roaster and the Parmesan Mediterranean Veggie Roaster. MELT IN YOUR MOUTH: A blend of spices and seasonings that caramelize on meat, fish and veggies, the Athenian Herb Dryglaze will bring your culinary skills to master levels.